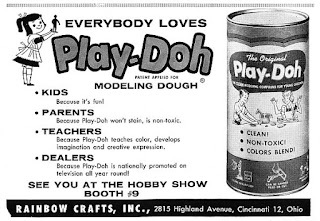 Play-Doh was invented in the 1930's by Noah McVicker in Cincinnati. He worked for Kroger to invent a product that was originally marketed as wallpaper cleaner. Noah McVicker worked with his nephew, Joe McVicker, to market this product. The early product was off white and came in a 1.5 pound package. In the 1950's everything changed when children in a nursery school discovered how much fun Play-Doh was to play with - as modeling clay. In 1956 the McVickers formed the Rainbow Crafts Company. The early working name for this toy was Kutol’s Rainbow Modeling Compound. Thankfully, it was renamed with something cute and catchy: Play-Doh. 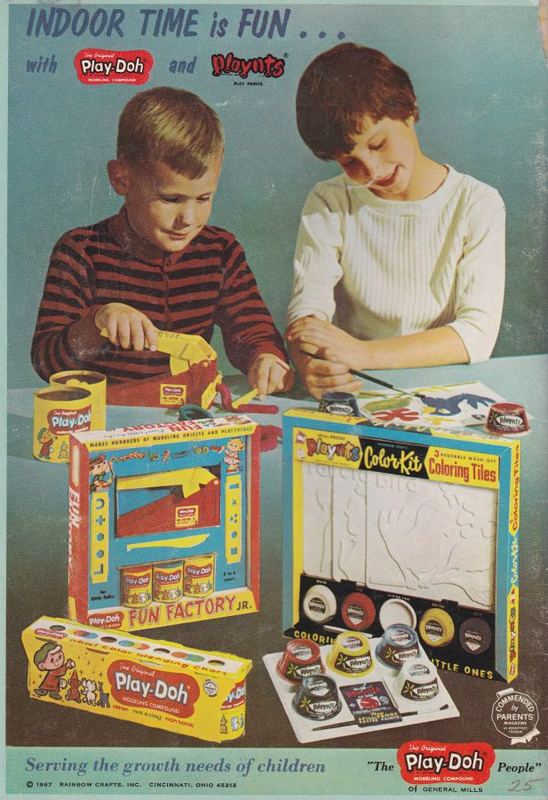 By 1957 Play-Doh was made in three primary colors. It was originally sold in one gallon cans and purchased for school use. 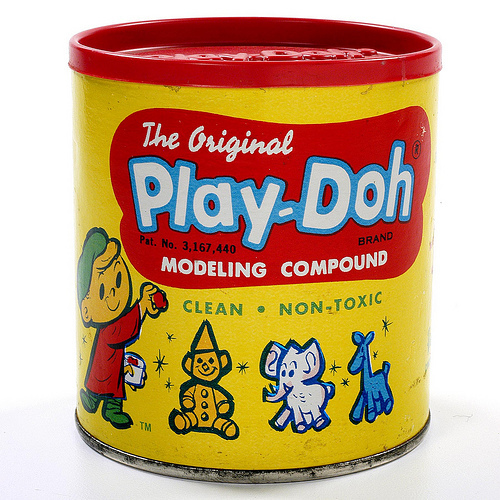 Play-Doh was sold at Macy's and Marshall Fields. 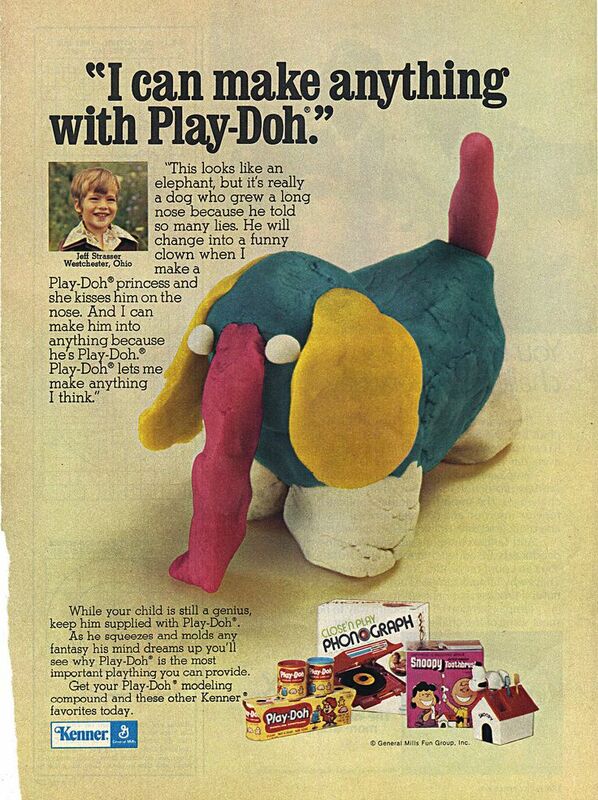 Play-Doh commercials appeared on popular children's shows, including Captain Kangaroo. The original Play-Doh mascot was Play-Doh Pete, a little boy in a beret. Over the years the mascot changed, and he eventually wore a baseball cap. Play-Doh is now made by Hasbro. It is still loved by children, and over 100 million cans are sold yearly. This popular crafting toy even has its own special day - September 16. 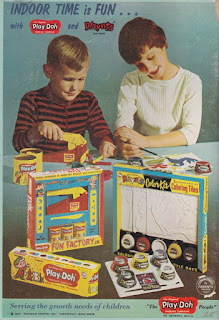 Did you love Play-Doh as a child? Any retro Play-Doh memories to share? I'd love to hear from you in the comments, below. Interesting! I think every kid loved play doh. I got in big trouble once for getting dinner bright red play doh on the carpet, haha. Wow this is an awesome "throw-back" post! I learned something new! My toddler loves play-doh and I really enjoy playing with him, brings back childhood memories! For me, it's the smell of Play-Doh. Very distinct. I made sure my son had plenty of Play-Doh for me...uh..him to play with.